All ShackLAN compatible decoders and integrated controllers use the same ShackLAN Band Decoder Configuration software as well as a common radio configuration process The software is a stand-alone EXE file and may be run from a CD or any location on a hard drive. No installation is required. First apply power to the unit and unplug the USB cable from the decoder/controller if it is connected. Now run the configuration software to begin the configuration process. Now connect the USB cable between the decoder and computer. Your computer should install a new virtual COM port and add it the list in the software. If your computer does not load the USB driver automatically you can get it from the link on the Downloads page and manually install it. 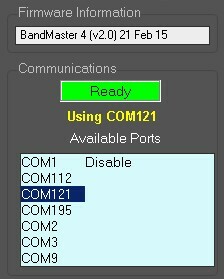 Select the newly installed COM port and the Communications Status Bar should turn green and indicate Ready. The current product and firmware information should also be displayed. You are now ready to configure the decoder to match your radio. Select your radio model from the drop-down list. If you wish to use the band data outputs from either a Yaesu radio or Elecraft K3 select Band Data as the radio model. Newer Yaesu models introduced since the FT-2000 all use the same protocol so select FT-2000 as the model. The Elecraft K2 and K3 use the Kenwood protocol. The default baud rate and interface type will be automatically selected for that radio model. If these are not correct you may change them after selecting the radio model. If you are using an Icom radio you must also enter the CI-V address. You can find this number in the radio manual or from the radio's menus. Enter only two characters for the address. Do not include the 'h' that is displayed on the radio menu. Valid characters are 0 thru 9 and A thru F.
When using more than one radio on the ShackLAN network you must to set the Radio ID accordingly. Each radio MUST have a different Radio ID or the antenna switches and relay controllers will not work correctly. 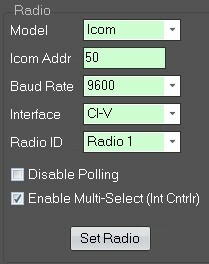 This option will prevent the decoder from polling the radio (asking the radio for data). You must have logging or radio control software connected to the decoder if polling is disabled or no data will sent by the radio to the decoder and no bands will be selected. This options is used primarily for Icom radios. The Icom CI/V system uses a bi-directional bus to send a receive data. It is possible for multiple devices to send data at the same time thus creating a data collision. Unfortunately, the CI/V protocol has no facility to detect corrupted data (Checksum or CRC) and these collision may result in occasional errors in the decoded band. If you see this happend enable this option. This option has no effect when using Band Data from the radio. The Multi-Select option applies only to the Integrated Controller for the 8-Pak series of antenna switches. When enabled, it allow you to select multiple antennas at the same time. Most users will leave this option disabled. When finished, click on the Set Radio button. The Communication Status indicator will show Updating and return to Ready when complete. You may now connect your radio to the decoder and verify that the proper bands are being selected. This completes the configuration process for most users. If you wish to enter custom band segments or have more than one antenna on a band continue to the next steps. NOTE: If something is not working correctly, click on the Set Defaults button and try configuring the radio settings again. All ShackLAN decoders can control ShackLAN equipped antenna switches (2x8-Pak and 4x8-Pak) as well as the hardwired Six-Pak and Rat-Pak switch controllers. Select your antenna switch in the Switch Type box. NOTE: This setting is only used to set the antenna selection limits in the software and is not saved in the decoder. Once configuration is complete, the decoder part of the controller is a set and forget system. The yellow BAND LEDs will indicate the currently selected band. One thing to remember is to set your logging or radio control software to 9600 baud regardless of the radio baud rate. The decoder performs any required baud rate conversion internally. The Radio LED is a multi-color indicator that shows the status of the radio connection. A steady GREEN indication shows nornal operation and the LED will "wink" occasionally indicating communication with the radio. If no data has been received from the radio for 10 seconds, the Radio LED will show steady RED which indicates no band information is available. Operation of the antenna switch control part of the Integrated Controller is simple and straighforward. To allow the band decoder system to automatically select antennas, press the Auto button. Manual control of antenna selection is activated by pressing any of the eight antenna buttons. Multiple antennas may be selected by simultaneously pressing the buttons for the desired antennas. The ANTENNA LEDs are dual-color and indicate all antennas in use by the switch. A steady GREEN light indicates an antenna is in use by the radio connected to the controller. A steady RED indication shows antennas in use by other radios. If you try to select an antenna already in use by another radio, the LED will blink RED to indicate a conflict. If you select multiple antennas and only some of them are already in use, the controller will show the connected antenna as steady GREEN and the unavailable antennas as blinking RED. Please note that the ANTENNA LEDs are controlled by data from the switch, not the pushbuttons, so a small delay after selecting an antenna is normal. The Antenna LED is a multi-color indicator that show the status of the network connection the the antenna switch unit. Normal operation is shown by a steady GREEN indication with an occasional "wink" showing network activity. A steady RED indication means no network connection with the switch and no antennas can be selected. A blinking RED indication shows no antenna connected and the amplifier protection system is activated.